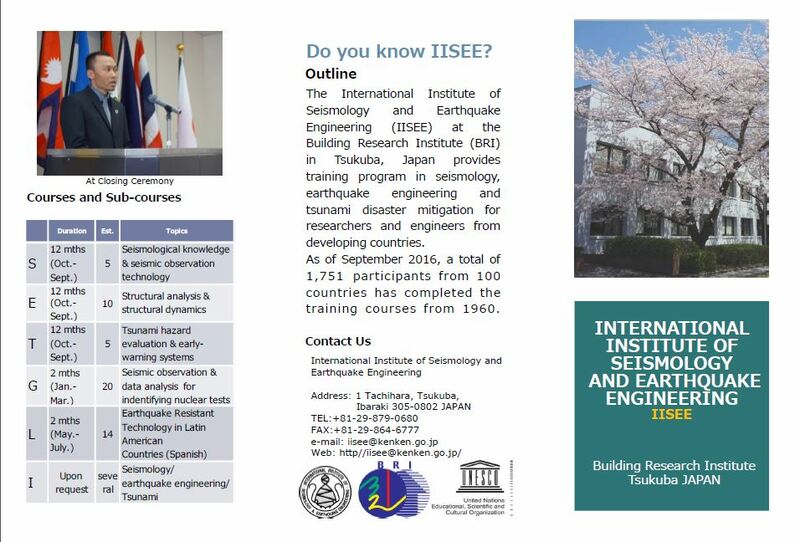 In order to contribute to earthquake and tsunami disaster mitigation, the International Institute of Seismology and Earthquake Engineering (IISEE) at the Building Research Institute (BRI), in cooperation with the Japan International Cooperation Agency (JICA), has provided training courses in seismology, earthquake engineering and tsunami disaster mitigation to researchers and engineers from developing countries. Currently there are four kinds of training programs: Training Courses in Seismology, Earthquake Engineering and Tsunami Disaster Mitigation. Latin American Earthquake Engineering Course (one of the Seminar Courses), a Global Seismological Observation Course, During 2009 to 2012 China Seismic Building Course was carried out. These training courses have been highly acclaimed both within Japan and around the world, and to date they have been completed by a total of 1,618 participants from 99 countries. 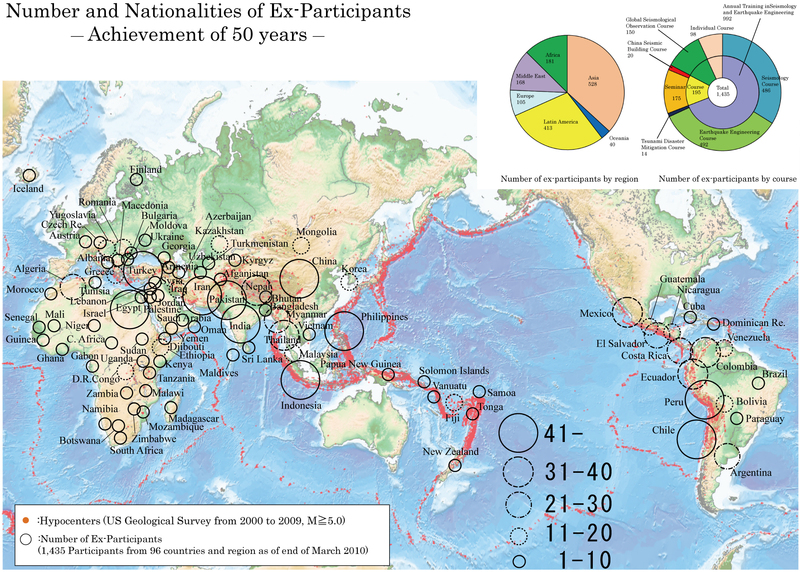 At the Second World Conference on Earthquake Engineering, held in Tokyo in 1960, it was established that there was a need for earthquake engineering training to be provided to young researchers from developing countries who had studied seismology and earthquake engineering. 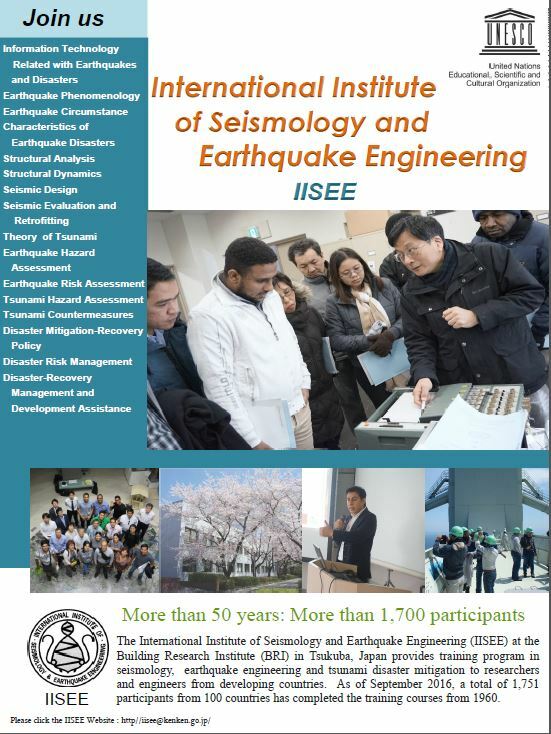 Consequently, the first international training in seismology and earthquake engineering, which consisted of a Seismological Course and an Earthquake Engineering Course, was carried out at the University of Tokyo later that year. The results of the training were widely praised by the international community, and the Government of Japan established the IISEE at the BRI in cooperation with OTCA (Overseas Technical Cooperation Agency). The first half of the second term of training during 1961-1962 was held at Waseda University, with the IISEE taking over for the latter half of the training. 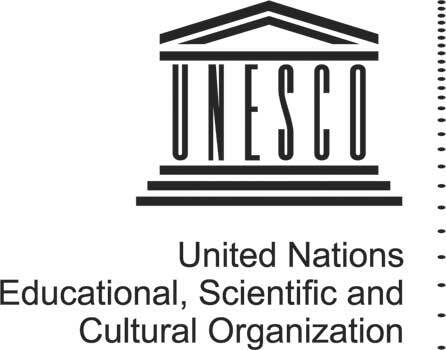 During 1963-1972 UNESCO(United Nations Educational, Scientific and Cultural Organization) has supported the Government of Japan to maintain IISEE training courses. Since then, the IISEE has continued to revise its curriculum according to requests from developing countries and in response to the advancement of academics and technology.